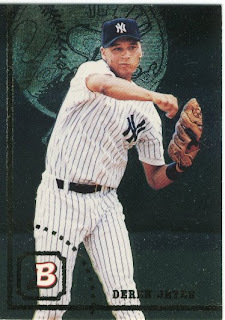 is one that sends me Jeter rookies. (Although Yankee fans, especially in the bleachers would have finished that another way.) I made a trade with Section 36 sending him the team set of 2009 Spectrum Red Sox (boo), and asked him to send over some earlier pre-2001 Jeter's, Mariano, or Jorge- providing they were cards Sooz already had. That was fairly easy since she has a zillion. 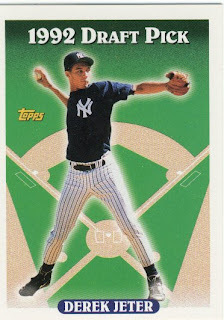 Good news for me because I got some awesome cards today, I scanned Jeter although there were Jorge cards, and Mariano as well. 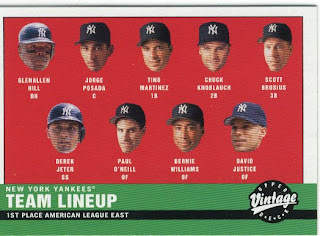 Gotta love the floating head action in this retro card. 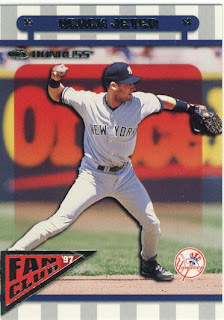 I have a similar card of the Yankees from the 2001 Fleer Tradition (probably the only 2001 box I bought back then- there was no Pujols card in there). 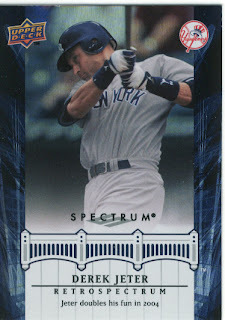 I like the retrospectrum idea for the Jeter subset, however it is not something I can actively pursue now with the Yankee Stadium Legacy debacle, but Sooz is trying to finish that set. I don't believe she has all of them yet, so if you have any extras let her know. Thanks for the props! 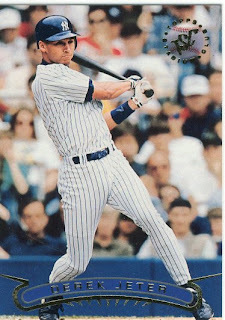 I can't believe the luck that you didn't have the Jeter rook. Glad I picked it out. Thanks for the cards you've sent. They're always top notch.